I will never be in a Ken Burns film, but if I were (a la Empire of the Air) my father would be mentioned as one of Lee de Forest's technicians who pranked him by blowing cigarette smoke through a rubber tube into a receiver prototype, angering the boss so much that he fired the entire lab, hiring them back only several days later. My Pop designed and built one of the first amateur kilowatt transmitters on the West Coast, W6CGQ. He posed me at age 5 behind the open black box holding a screwdriver as if to adjust something. A movie director once had a balsawood replica made of the transmitter to be chopped to pieces in a Western. It came close to that fate when a neighbor came to our door with a gun, threatening my father because he was interfering with the guy's television reception. No doubt of who did the interference because there was a tall rotating telephone pole with an antenna next to the house. My Pop kept Navy radars going at sea during WWII. He dropped a magnetron overboard to prevent its capture by enemy warships. When my Pop returned home, at the dock a woman said to her companion "What's that damn civilian doing on board?!" He was not uniformed as all the other sailors. Later when Walt Disney offered my Pop the position of Chief Electrical Engineer, my Mom talked my Pop out of taking the job "because Disney was just working out of a garage and had no future." My Pop died at 57 just two months before he could have gotten Full Retirement from Western Electric. The Company gave my mom a year of his salary, about $8K, and told her to sell her house and move to an apartment. My first day in Engineering included my boss telling me that "We have not had much luck with graduates from your college." Oh boy, did that scare me! I had spent 5 years doing homework on the 4th floor of the campus library where all the Science books were. No time for anti-war sit-in demonstrations below. The Apollo Program filtered down to Ryan Electronics thru layers of subcontractors. We were below so many that there were fossils galore, including the actual blueprints of The Spirit of Saint Louis still in the Print Crib. (It would have been The Spirit of San Diego if not for the San Diego politicians rejecting the idea of a donation to upstart T. C. Ryan. ) Those fading blueprints made possible an exact replica for The Smithsonian Museum. My job on the Terminal Descent Landing Radar was as a green design checker. Things were kept hush hush I discovered -- and no one had told me -- that System Tests included flights on a helicopter. NOT BY ME ! I heard so many tales of plane crashes at Ryan that I wanted to remain firmly on the ground. Fortunately, no one ever insisted I ride along. Back to my digital design task. Turned out that the problem(s) were due to classic race problems--not the ones in the news, but two signals changing at nearly the same time at the inputs to a gate. The tiny overlap was giving tiny spikes at the output. How did you FIX that in the Good Old Days? I was instructed not to re-analyze the Logic but to just add small a-few-picofarad capacitors at every misbehaving output in the entire design. Stop rolling your eyes! It worked fine then, no matter how awful it sounds now. The last problem to be discovered was the effect of RESETTING the radar, which was done with a single panel switch in the LEM. Me and another engineer were testing some "inconsequential changes" to the prototype on the bench. The radar returns were mixed down to audio and tracked with a "moving filter" auto-tuned in a loop to maximize the rectified output "DC." That worked okay. Then one of us, maybe me (? ), pressed the RESET button. We looked at each other quizzically, wondering where the hell the signal had gone. Did we screw up somehow ? It took us several minutes to realize that pushing the RESET button was NOT in the written God-given Procedure. Oh boy. But what went wrong??? We had done a NO NO. Oops! 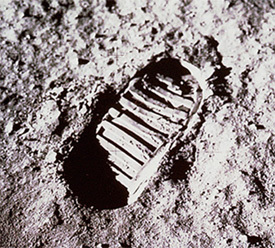 Anyway, to "Tell The Rest of the Story," as a famous radio fellow used to say, the RESET had forced the tracking loop to return to upwards of 40,000 feet, back to "hunting for the Moon," and slowly slide down to the real altitude signal FOUND AGAIN under maybe as little as a few tens of feet. Search again, fool ! BUT WHAT IF YOU WERE ACTUALLY AT MAYBE ONLY 100 FEET ? OMG. If Armstrong had pushed the RESET button, he would have lost all Altitude and X-Y Position and Velocity Information for maybe a few MINUTES. That possibility was...A CRASH on the lunar surface. Not good publicity in the Race With The Russians. Like in the movie Trading Places on the Floor, the scream and yell were "DO NOT PUSH THE LANDING RADAR RESET BUTTON IF YOU ARE BELOW X FEET ALTITUDE !" I cannot remember what X was, maybe like the Abort Limit or Point of No Return--as in the movie No Highway In The Sky. Armstrong would NOT have been fazed by our last-minutes warning, I guess, since he landed with just seconds of fuel remaining. Our Company certainly did NOT want bad publicity. Thank God for that other kid who told NASA to ignore the computer's overload warning code. And I guess Thank God we had done something off the Procedure. Do Big Companies NEED a few novice EE's who cannot follow directions to the letter? Wage Busting ended my job there at Ryan after 4 years, as they tried to bring me back in at half my previous salary. I rejected that offer flat. I had become jaded from being slammed for "NOT protecting Engineering at Standup Production Meetings" where I admitted pointing out design problems, unanswered for years of assistance-requests from Production. (Like 75V applied to a 40V SCR....) My last effort was to trace ground-test equipment schematics, another ditch-digger task, and found that the main reference voltage was not even connected to the drone itself. More disbelief in action. (I had gotten my Security Clearance only because I went to my boss and asked if the numbers on the "target drone graph" were "really 10's of thousands of feet altitude." The top of the graph was 100,000 feet ? Of course, I was NOT supposed to know that the "target drone" was for flying over China, which fact soon appeared on the headline of The San Diego Union with accompanying photos of RYAN ELECTRONICS inside name plates taken by the Chinese. Oops. Shot down or just dead-reckoning uncalibrated-radar lost? I went on to work at many many companies--designing spectrum analyzers, frequency translators, high-energy physics electronics, air pollution monitors, non-invasive brain scanners (using SQUIDs), nuclear weapons testing FM doppler tracking receivers for artillery shells, vibration analyzers, underwater communications coders, waterfall displays, etc. My best cartoon work was drawing the block diagram for the atomic clock (Rubidium, military-grade) used in all the US GPS satellites. I once played as the Liaison Engineer for a Russian Hydrogen Maser project, which was dropped after I pointed out its shoddy design, and actually it was dropped down a flight of stairs by the janitor (at $2M loss, compared to the $75K an elevator would have cost, if the building had been 3 stories instead of just 2, per the city ordinance. A CEO at the local Kodak engineering refused to follow his Chief Engineer's post-interview recommendation to hire me because I was obviously "a job jumper" as proven by my 4 page resume. I asked him "What if those several mere jobs in Industry and at UCSD had been college degrees instead?" He ushered me immediately out of his corner office. Electronics is now just a hobby for me. I am back at the learning stage I was in at ten years old, then building Heath and Eico Kits, getting shocked thru a screwdriver with 250 Vdc, and comparing my "Green Worm Machine" (oscilloscope) to the ones in thrilling black-and-white science fiction movies (with heroes like Richard Carlson), saving the world from Magnetic Monsters and Cyclopsian ET's from Outer Space. I cobbled together UV diodes to make a few battery-operated scorpion-locating flashlights, then discovered that the new ones at Ace Hardware were selling for maybe 10% of my sad Radio Shack efforts. Kits for Tesla Coils, Crystal Sets, Sonic Spy Ears, 6W blue laser "pointers" NOT FOR KIDS, and PLL-tuned radios, etc. take up time. At 75 ("and a half" to return to childhood expression) I just hope you other Life Members appreciate what my dear wife calls my "sick sense of humor." Now at the end of life, "The older I get, the better I was." A real astronaut, I think Alan Bean, once visited Ryan Electronics to "inspect" the landing radar. The head of our company outpost finally smugly asked Bean--who looked way too young to be the kind of astronaut I had seen in 1950's Hollywood sci-fi movies--"What do you think of our one-million dollar breadbox-sized landing radar, now that you have seen it close up ?" Bean replied "Actually, I prefer the 75 cent graticule on the LEM window that I can lineup with the lunar horizon." You could hear the crowd of us time-wasting last-minute gathered-up Scrooge-whipped employees gasp, cough, and laugh. We slaves were never again treated to seeing and hearing from another visiting celebrity. Weirdly, a young-adult sci-fi book in the 1950's had a hero named Major Armstrong who piloted a rocket ship around the entire solar system in a race, just like an auto race, soon after he had been the very first man to set foot on the Moon. The book is titled "Rocket Jockey." I would have loved to ask him, the real pilot, if he had read that book as a kid like me. Had it been an inspiration? Lowell Observatory had Neil Armstrong to a dinner in Flagstaff, Arizona, a year or so ago. The "donation" required was $1,000 to meet and shake hands with him afterwards, so my wife and I could not, did not, RSVP favorably to go. I would have asked him "What did you think of our landing radar?" (Like Scrooge in the fine musical version, I must add "What a fool I have been?" No time machine.) Was he just looking out the window thru the horizon graticule while passing over the house-sized boulders? His heart was reported, telemetered, back to Earth as being hardly increased above resting rate. This page was last edited on 25 March 2019, at 18:15.